There is something to be said about changing gyms within a small province. In my imagination, at the very least, if you were to change gyms somewhere bigger, say in Bangkok, the pressures that come with the move might not be as noticeable – but again – I could be totally wrong having never lived in Bangkok! 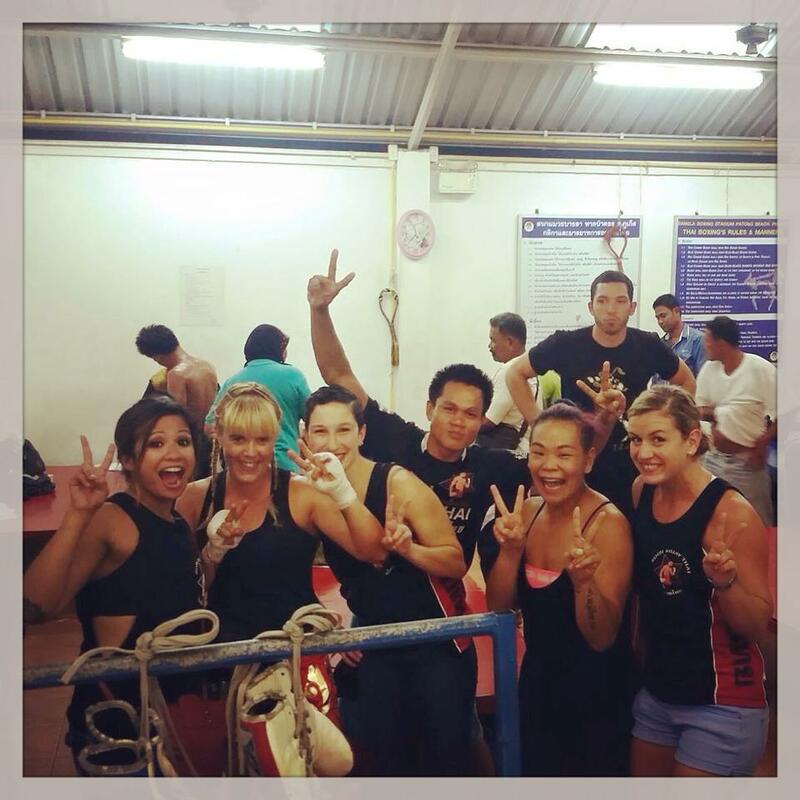 Rawai is a smaller province within Phuket, where many Muay Thai gyms are located. We are in a great spot near the beaches and piers, but not too over overwhelmed by the tourism of somewhere like Patong. I couldn’t tell you how many gyms there are in this area as we get some cross over with the Chalong gyms (which is the next province over), and there are so many smaller Thai gyms in this area, it’s hard to keep track. It’s not an uncommon thing for a fighter to change gyms though. I don’t write this as though I am the only person to have ever moved on from a gym. People move for a variety of different reasons. My own main personal one was because I was moving to a gym that were willing to fully sponsor me. I was also ready for change, albeit I was unaware of that particular need at the time. After spending a year at Sinbi, I naturally forged some very close friendships, and despite my change in gyms, my friends have not changed. I still attend their fights and they mine. We still eat meals together and spend time together, more so than I do with the friends I have made at AKA. Many of the short stay students I became friends with last year, I saw on their return trip this year also. I have also found recently, that because I spend more of my time with Sinbi students, the new friends I make are also Sinbi students who I meet through my current friends. It’s an interesting position to be in though, and sometimes quite an awkward one not only for myself, but for my friends. For my second fight under AKA, and no surprises here, I was matched against a Sinbi fighter. It was not a match done out of malice, and we all knew that this particular fight was a long time coming. I had fought this girl when I was a Sinbi student, about 6 months prior. We had an extremely close fight and it was a rematch that I knew would happen eventually, it was just a coincidence that I moved to AKA and my opponent moved to Sinbi! It made the rematch all the more exciting for spectators and those of interest. It was definitely a position my old trainer Nai struggled with – someone to whom I am still close with to this day. He had taken part in training my opponent, and wanted us to both to do well. Nai told us before the fight that the couldn’t be ringside and that he would just wait upstairs. Later reports showed that he was losing his s*it upstairs as the fight progressed. After my victory, he was quick to exit, the discomfort mounting on his end and him not really knowing if he should be supporting my victory, or consoling the Sinbi loss. A lot of our mutual friends struggled on this one also. After this win, I definitely noticed that the air of competition was now rising. It’s almost like if you change gyms, your old gym is surprised if you improve after moving on. It’s interesting how insular their thinking can be sometimes. I knew after this win that there might be a need to prove something on the opposing side. As much as I was hoping I could walk away from this fight with no back lash, it’s very seldom the case within competitive sports. I have requested, for the time being, that I don’t fight any more Sinbi students. In the future, when everyone has really moved on, then I welcome the opponents. 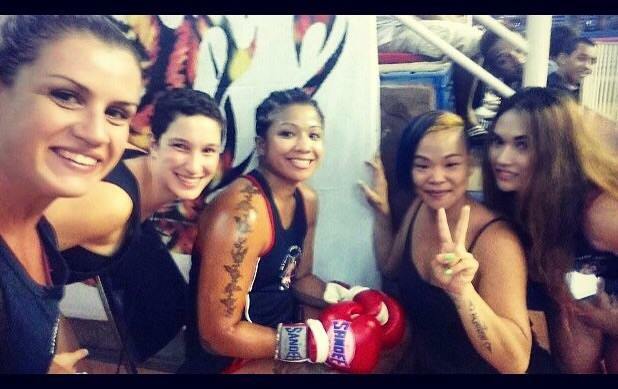 On a later occasion, we went to the stadium to watch my friend Nolwenn make her Muay Thai debut. An evening of where I was fight training, and Nai was preparing to fight one of my new trainers, I had agreed to drive us into the stadium so we could leave immediately after Nolwenn’s fight and get to bed before the usual 1am after a long night of fights. 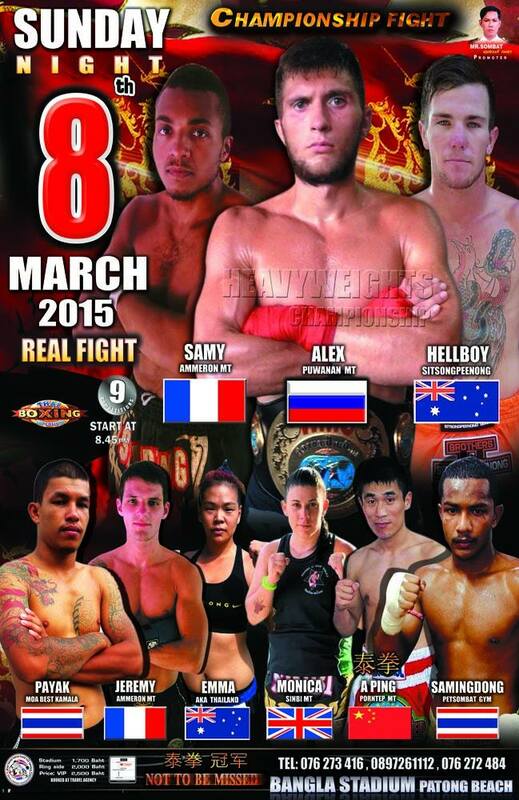 In my fatigued state, I had completely forgotten that one of the AKA fighters was fighting on the same card. I arrive at the stadium and immediately went to check on my friend; this is when I noticed the AKA entourage. It felt a bit strange, walking up the stairs, seeing the sea of AKA shirts, only to walk over to the congregated Sinbi students and trainers. As I said my hellos and had my jokes and laughs with the Sinbi crew, that sensation you get when you feel like someone is watching you sent a nervous shiver down my spine. I quickly joined with the AKA crew. I didn’t want to be rude and I definitely wanted to say hi to everyone. It probably felt more tense for me than anyone else – maybe no one had even noticed just yet. Forgetting the agreement I had made with Nai, to drive us home immediately after, I looked at the run sheet to notice that the AKA fight was the very last fight of the night. Of course he was. I made my way to him to quickly apologise that I couldn’t stay to watch him fight. It was horribly embarrassing despite how polite and understanding he was about the situation. After Nolwenn’s fight was over, we proceeded to the stairs where all of my trainers were asking “where are you going?”. In an attempt to lighten the mood I quickly yelled back “I’m driving Den Sarakam (Nai)!” Before they could register what I had said I was bailing down the stairs and out of the stadium. ‘Sorry guys – I can’t stay – I have to drive Sedtee’s (one of my new trainers) opponent home…’ Awks. The entire drive home I had flashes of being murdered on pads the next day at training for my unruliness. The fight of Nai v Sedtee was also a lot of fun for my trainers. They took to teasing me at training about the fight. It began with them asking me who I was cheering for; eventually it wound up to be everyone jokingly asking me if I was going and told me that I had to wear an AKA shirt and cheer for Sedtee. All in good fun thankfully. I laughed with my trainers and screamed “bpai doo mai dai!” (can not go watch!). It definitely made me feel a little more relaxed about the recent, and obvious, cross over my life has with both gyms. When you start at a new gym, it always takes time to get to know the people who are already there. Friendships are usually well established and you are the outsider coming in. Most of the time you feel like you’re a foreign creature to everyone, one of which needs to be studied and analysed before moving forward. Being a girl can always complicate things unintentionally. As much as you try to keep the peace, unfortunately you will not always get along with other girls. I have been very grateful at AKA to not have run into this issue so far. When I started at Sinbi it took a long time for me to really set myself up and get comfortable with people and find those who I would later call friends. Now that I’m at AKA, and still friends with all of my Sinbi friends, it puts me in a bizzare position. I’m in, but I’m not really in. I’m there and everyone is nice to me, and I get along with everyone fine, but there has been no significant integration into my personal life. I guess the question remains – does there need to be? Given that I am not new to Phuket, that I have an established life here already, how much more do I need? I am happy, and I am slowly building new relationships with AKA so I guess I have never really felt the need to push for more although sometimes I have moments where I think it would be nice. AKA has welcomed me with open arms and it is a place where I feel comfortable and at home. I have a great relationship with the team of trainers and I have had no obvious issues thus far. Aside from the awkward runs ins here and there, so far it’s not been as horrible as it could be! I haven’t been traumatised yet, despite hearing some other peoples horror stories and hope things continue along peacefully. At the end of the day, I continue to live my life the way I intended – to be happy – and to love the life I am living. After all, what’s life without a little awkwardness and a group of Thai men poking fun at you!